Yesterday, I testified before the Maryland State Senate Committee on Education, Health, and Environmental Affairs Committee. 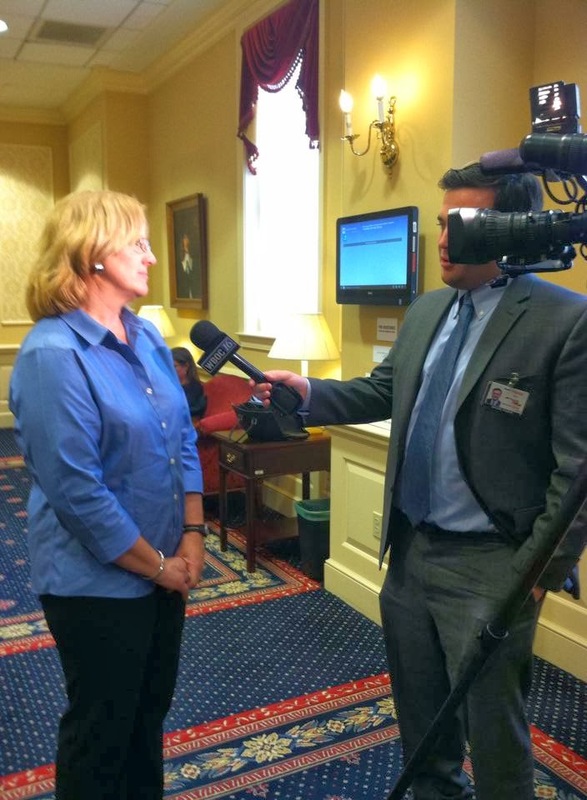 I was speaking against SB778 "Genetically Engineered Foods - Labeling Requirements"
"Requiring specified raw foods and packaged foods that are entirely or partially produced with genetic engineering to display a specified label beginning on July 1, 2015; requiring a manufacturer to include a specified label on specified foods; requiring a supplier to include a specified label on a container used for packaging, holding, or transporting specified foods; requiring a retailer to place a specified label on a shelf or bin containing specified foods; etc." She introduced the hearing legislation by asking why people acted "ashamed or embarrassed" about GMO. She claimed she was a supporter of biotechnology and wasn't afraid of it but that consumers have the right to know. But many of the groups who claim that consumers have the "right to know" are actually working toward a ban of the technology. Organic consumers Association: "Once GMOs foods are labeled, informed consumers will move to protect themselves and their families by not buying them. Once enough consumers shun GMO-tainted and labeled foods, stores will stop selling them and food manufacturers will stop putting GMO food ingredients in their products." Center for Food Safety: "Labeling #GMO food is not enough. We must keep new GE crops out of food supply to begin with take action @TrueFoodNow"
March Against Monsanto: "Many presume the March Against Monsanto is a protest about GMO. While food plays a very big role in the global protest, there are many insidious tentacles to the biotech giant. MAM seeks to destroy the root." Truth-Out: "GMO labeling laws are the cornerstone of the anti-GMO movement. But consumers are also expanding the fight by demanding outright bans on the growing of GMO crops." In fact, two consumers who testified at the same hearing in favor of labeling voiced the very same thing, that labeling didn't go far enough, that biotechnology needed to be banned. The Consumers Union, Food and Water Watch, and Union of Concerned Scientists had their legal team of suits presenting. I'm not going to restate their position because if you google Michael Hansen or Doug Gurian-Sherman, you will find pages of testimony nearly word for word identical to what they told the senate hearing yesterday, including continuing to claim the validity of the retracted Seralini study. In response to Senator Montgomery's comment: I am an unashamed and unembarrassed supporter of biotechnology. On my Maryland farm it has resulted in higher yields and lower pesticide applications, year after year, wet season, dry season, normal season. Even when Hurricane Irene knocked our corn flat, biotech held its ears better than non GMO corn by 26 bushels per acre, which in a very crappy year, makes a world of difference to our family farm's ability to stay afloat. Biotech out perform our specialty seeds: non GMO & Identity Preserved. Yes, we grow and segregate a variety of different types of grains and seeds, all of which are tested and verified as pure to the variety they are supposed to be. This year, we will have 900 acres of grains and seeds under some protocol for identity preservation. The seed must be genetically consistent and true to its traits, uniform in shape, size and color, and free from weed seed and contamination. They are tested and verified to meet those standards. So co-existence of conventional, biotech, and organic/Identity Preserved/nonGMO grains and seeds is possible. We do it every day on our family farm and have for many years now. Biotech threatens none of our niche or specialty markets. These farming systems are not and should not be considered mutually exclusive. When you combine higher yields consistently, with less man hours on a tractor, burning less diesel fuel, and saving pesticide sprays, you have a far more sustainable family farm on the environment: less greenhouse gases, less fuel consumption, less pesticide use = protecting and preserving more resources. But to the larger picture, biotechnology has brought us Humulin, Epogen, Herceptin and many, many other excellent lifesaving medical therapies. Biotechnology means we don't harvest insulin from hogs or cattle pancreas anymore. Biotechnology means we don't harvest the enzyme chymosin from young calves to extract rennet from their stomachs which is then used to coagulate milk in the cheese making process. To me, this is progress. To me, these are reasons to oppose mandatory labeling of "GMO". It is both safe and efficacious in medicine and in food. Science and research concurs. Published last year, An overview of the last 10 years of genetically engineered crop safety research reviewed 1783 studies, 312 of which were GE food & feed consumption studies finding "no scientific evidence of toxic or allergenic effects". The researchers concluded that "that genetic engineering and GE crops should be considered important options in the efforts toward sustainable agricultural production." 1783 studies... 312 of them on consumption of GE food and feed. That's a safety track record. The technology is valuable in both medicine and food. The technology has many benefits to mankind.No one but the activists are saying biotech was supposed to be a "silver bullet". Farmers know its one of many tools in the tool box to improve sustainability and produce more food on less land. Efforts to undermine the technology through mandatory GMO labeling that falsely implies there are safety concerns where none exist is misleading and a disservice to consumers.